Aikido is a relatively new Japanese martial art, created by one man Morihei Ueshiba (b. 1883 – 1969), known as O-Sensei (the Great Teacher). Aikido is the only purely defensive martial art. Aikido techniques uses circular rather than linear movements, with the defender moving out of the line of attack. Aikidoists learn to evade and redirect the power of the attack, resulting in the attacker being unbalanced and thrown or immobilized. Because of this principle of “non-resistance”, Aikido can be effectively performed even against larger and stronger opponents. From this aspect it can end an attack suddenly, severely, and decisively or dissipate it with the gentleness of a soft breeze. But Aikido is something more than only an effective self-defense system. 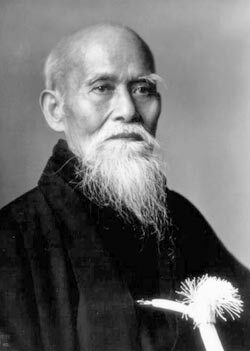 To understand these ideas and principles it is necessary and essential to know something about Morihei Ueshiba O-Sensei life and work. Since for him Aikido was a Way of life, there can be no end to one’s apprenticeship. This is something that all of us who practice Aikido should always keep in mind.